An adventure spy novel more than a murder mystery – also Cannonball! In this book, we meet the adventurous Victoria Jones, a young woman with a knack for lying frequently and convincingly, who shortly after being fired from her most recent position as a mediocre shorthand typist, meets a handsome and charming young man in the park. They strike up a conversation, he confides that he is about to go to Baghdad and asks to take a couple of photographs of her as a memento. Victoria is smitten, and as the young man she’s fallen head over heels for is going to be in Baghdad, she needs to go there to. A few days later, her contact at the employment agency calls to confess an American woman needs a companion to accompany her on her journey to the self-same city and Victoria can’t believe her luck. Unbeknownst to Victoria, who just wants to reunite with Edward, the young man in the park, there is a secret international diplomatic summit planned in Baghdad and there are sinister forces who are trying to sabotage it. A heavily disguised agent named Carmichael is dodging assassins all over the Iraqi countryside trying to get proof to his superiors about the conspiracy. An efficient and mysterious young woman named Anna Scheele surprises her American employer by asking for time off to go to England to visit her ailing sister. Richard Baker is an officious archaeologist on his way back to the archaeology dig of the illustrious Dr. Pauncefoot-Jones. Mr. Dakin is the official trying to ensure that the summit goes off without a hitch. He knows that there are a number of security risks and is hoping for the safe return of his agent Carmichael. Once in Baghdad, Victoria’s brain is working overtime to figure out how she’s going to manage for money when her job as companion for Mrs. Clipp is ended. On one of her first nights in Baghdad, a wounded man staggers into hotel room and dies in her bed after whispering a few seemingly unconnected words. This man turns out to be none other than Carmichael, and his death in her room puts Victoria in the centre of a dangerous conspiracy. When she uses her wits and what little information he gave her to track down her beloved Edward, she starts to suspect that he may not have been entirely truthful when he claimed during their brief meeting that he’d love for her to come and see him, and that there are a number of young women in the organisation he works for who don’t look kindly on their new rival for Edward’s affection. Soon Victoria finds herself abducted and abandoned in a house in the Iraqi countryside. Ever resourceful, Victoria gets out of the house where she’s been locked, but is stuck wandering far from civilisation. Her little white lie that she’s Dr. Pauncefoot-Jones’ niece, in Baghdad to join him on his expedition come back to haunt her when she’s rescued by none other than his assistant, Richard Baker, en route to the expedition in question. Will Victoria’s gift for lying get her out of another sticky situation? Will she be able to figure out what the dying words of Mr. Carmichael meant, and help Mr. Dakin stop the shadowy conspiracy threatening the peace summit? This book is much less of a murder mystery than it is a suspenseful adventure novel. 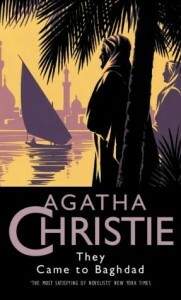 Unlike the many more traditional Agatha Christie novels, where Miss. Marple or Hercule Poirot gather a number of assorted suspects in the drawing room of a country house (or train carriage, or fancy ship or whatever exotic location Christie decided to place them in for variety), this book mainly follows the brazen Victoria as she lies her way from a boring typist’s job in London to being an essential, if somewhat unwitting part in an international conspiracy. While some might find her quite an unlikable heroine, I found her delightful. She’s not so much a compulsive liar as a very good actress who thinks swiftly on her feet and improvises skillfully. She also doesn’t really seem to lie to directly swindle people, just to take advantage of things she might not have otherwise, such as impeccable references or pedigree. She’s a bit too impulsive than is healthy, but she discovers that herself when she reunites with Edward in Baghdad and starts suspecting that he may not be as smitten with her as she was with him. When she ends up at the dig of Dr. Pauncefoot-Jones, she is lucky that the old archaeologist is extremely absent-minded and scatter-brained, wholly focused on his dig, so he can barely remember whether he has a niece at all, mistaking Victoria for an anthropologist scheduled to arrive at the dig some weeks later. Richard Baker, on the other hand, knows something is up with the strange woman he found wandering in the countryside. He just can’t figure out why she would pretend to be his boss’ relative, wildly fabricating her knowledge of archaeological artifacts. Most of my favourite Agatha Christies are the stand-alone ones, often featuring a romantic subplot while there’s murder mysteries and adventure. Books like Why Didn’t They Ask Evans? (the first Christie mystery I ever read), The Man in the Brown Suit and this. I hadn’t read this book for nearly a decade, when I decided to re-read it so it could be my 52nd book of the year. While the book started more slowly than I remembered, introducing the various minor players in the bigger game, to a reader who has no idea how they all connect, it gets moving plenty fast enough once we get introduced to Victoria. I only half remembered the ending, so watching all the pieces coming together towards the end of the story was almost as enjoyable as reading the book for the first time. I’m glad it still holds up. So with that – Cannonball! Share the post "An adventure spy novel more than a murder mystery – also Cannonball!" Congrats on your Cannonball–nice choice! Congrats on the Cannonball!! And wooo for picking a book you love to round it out with! Thanks to everyone for your kind words. Now I just need to get caught up with my last three back-logged reviews, before work most likely swallows me up completely for the next three weeks. I’ll make time to read, because really, otherwise I’d probably die, but I doubt I can take time out to review as well. Hooray, Cannonball!!! And congrats to you for fitting it in before the end-of-term craziness ramps up! This one is on my list for next year!